AWWW Amy this is soooo cute!!!!! What a darling card this is!!! ADORABLE IMAGE!!! 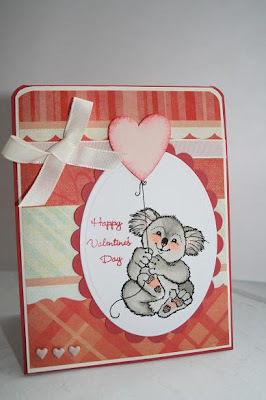 Awwwwwww, I just ADORE that koala from Angels Landing and how PERFECT to make the balloon a heart! I love it! This is amazing. Love how you got more bang for your buck too. Soooooo adorable! Feel better soon my friend ... you probably aren't getting enough rest with the schedule you keep! Please try to get extra rest ... that always helps! Very cute and good idea. When I'm thinking about a stamp or set, I too think about how many different types of occasions I could use it for to get the most bang for my buck.